Transformers: Age of Extinction is now available for purchase at all major US retailers in the 3D Blu-Ray, regular Blu-Ray and DVD formats. Which exclusive will you be getting? If you aren't sure, let's go through your options. There's quite a few! Check them out after the jump. -Includes 3D Blu-Ray, Blu-Ray and Digital Copy. 3D Blu-Ray fills up the whole TV screen with no black bars during scenes filmed with IMAX cameras. - Includes feature film on Blu-Ray with Fathead decals. - Includes Blu-Ray, DVD and Digital Copy with Optimus Prime and Galvatron Kreons. - Includes Blu-Ray, DVD and Digital Copy. - Includes Blu-Ray, DVD and Digital Copy with 3 mini-figures (Optimus, Bumblebee, Stinger) and TF4 logo magnet. - Includes Blu-Ray and Digital Copy of each film in special heroes vs villains packaging. - Includes Blu-Ray, DVD and Digital Copy with drawstring Optimus bag. 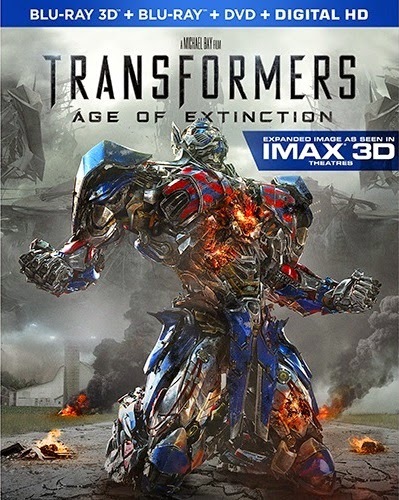 - Includes Blu-Ray, DVD and Digital Copy with Grimlock and Optimus Prime statue. - Includes feature film on regular Blu-Ray.